Two people were fatally shot and another 11 were injured after a 24-year-old man opened fire on a high-stakes esports tournament at a Florida mall Sunday. 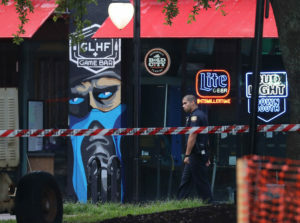 The suspect, a Baltimore resident who was in Jacksonville, Florida, for the “Madden NFL 19” video game tournament, killed himself after attacking a room full of competitors. Here’s what we know so far about the attack. The Jacksonville Sheriff’s Office initially said on its official Twitter account that police were responding to a mass shooting at The Jacksonville Landing, a riverfront strip of restaurants, bars and shops that runs along the St. Johns River. The office gave an all-caps warning to “STAY AWAY” from the area. Later, the office confirmed that shooting took place at the gaming event, adding that the first 911 call came in at 1:34 p.m. local time. Another followed two minutes later. In a video circulating on social media, sounds from the shooting appeared to be captured since the gaming event was livestreamed. Police have yet to confirm how many times the suspect fired, but 12 shots could be heard in the video. Hours later, Jacksonville Sheriff Mike Williams told reporters that a suspect, identified as a white male, was dead at the scene. Authorities said three people died in the shooting, including the suspect, who turned the gun on himself after opening fire. Of the 11 additional people injured in the attack, 10 were wounded by gunfire. The other was treated for a non-gunfire injury. “I feel fine, just a scratch on my head. Traumatized and devastated,” the gamer added. Police identified David Katz, 24, of Baltimore to be the gunman. Jacksonville Sheriff Mike Williams told reporters in a briefing Monday that Katz carried two handguns and extra ammunition into the building. The sheriff said investigators believe he only fired one handgun during the attack. The weapons appeared to have been recently and legally purchased. “We have yet to have a concrete motive,” he said, adding that no notes from the suspect have been found. “He’s a man of business. He’s not here for the experience. … He’s not here to make friends,” the announcer added. According to documents related to his parents’ divorce, Katz was at one point hospitalized for psychiatric treatment, The Baltimore Sun reported. FBI agents previously confirmed they had entered a Baltimore townhouse, believed to be a home belonging to the suspect’s father. Williams told reporters Monday that authorities have also located and searched the suspect’s vehicle and hotel room in Jacksonville. Williams said the FBI is assisting in the ongoing investigation, including looking further in the suspect’s background. There are not currently any other scheduled briefings on the shooting, the sheriff added.